For this site, an old toy is any push, pull, crib, or stand up children's toy made prior to 1945 and made of wood or metal. Most of the toys featured here were made between 1890 and 1935 but we do have pictures, catalogs, and descriptions of toys made up to the 1970s. Here you will find toy photos, toy company histories, and online Old Toy Shops where you can buy great old toys. New information is being added daily. We now have over 586 pages of toy articles, identification guides, and old toys catalogs with more than 10,000 photos of old toys and dolls. Most of these articles were written by toy researchers, toy collectors, and family members of the old toy companies. We now have the largest collection of Schoenhut circus photographs on the Web and the best Humpty Dumpty circus identification guide too. Let us know what interests you. I buy individual and collections of old toys 19th century through WWII. Click here to see toys I have for sale. Pennsylvania Humpty Dumpty Circus Collection For Sale - Will be adding over 100 pieces to this collection starting May 15, 2018. 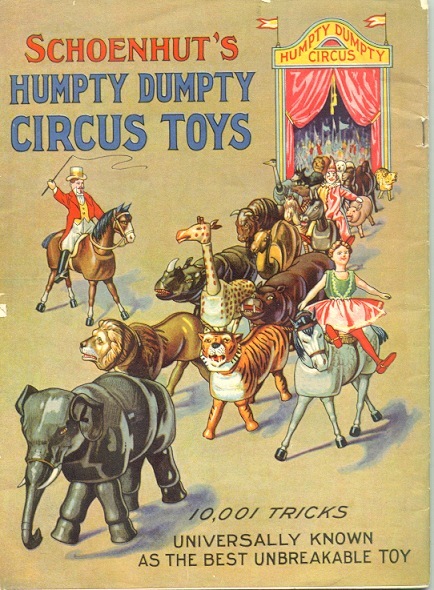 Maine Humpty Dumpty Circus Collection For Sale - will be adding more pieces to this collection later in May. Iowa Collection - coming May 20th. We do restringing and cleaning of the Schoenhut circus, Jaymar, and other wooden toys and dolls. Prices range from $12.00 to $20.00 per item. Contact me for details. We have a list of recommended craftsmen for more extensive restorations. See all of our services here. Join the Schoenhut Collectors' Club. 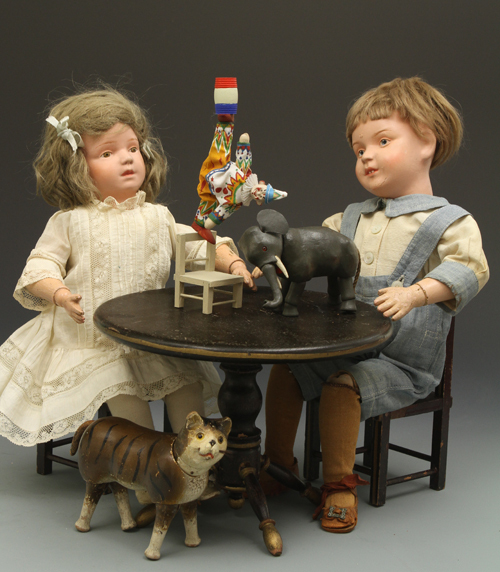 Whether you collect Schoenhut wooden toys, dolls, rolly dollys, or the Humpty Dumpty circus, you will want to join the Schoenhut Collectors' Club and meet other collectors with similar interests. The Club publishes a 20-page, full color Magazine every three months. 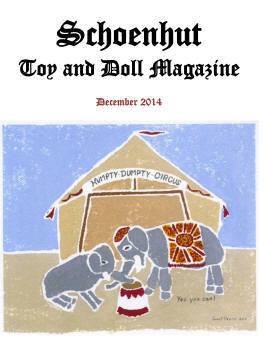 Each issue contains lots of Schoenhut doll and toy collecting information and classified ads as well. Our Club's 34th annual convention will be in Charleston, South Carolina, November 3rd, 4th, and 5th 2019. For both membership and convention information click here. 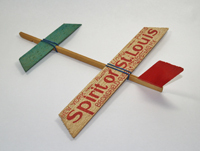 Dave Pecota has discovered a remarkable early glider - the Spirit of St. Louis. Read about it here. Thanks to Theriault's Antique Doll Auctions and Susana from DaisySusanCo, Argentina, we have created pages on the Swiss-made Bucherer dolls from the 1920s. See them here. Read this new article by Judith Lile here. See these popular 1920s novelty dolls here. We have scanned all 350 pages of the 1931 Supplee-Biddle Toy Catalog. This amazing catalog shows samples of almost all of the toy types being sold at that time. See this catalog here. Judith Lile has written a fascinating article about the history of Punch and Judy plays. Read it here. is now shipping. Click on the cover above to buy your copy from Amazon.com. We have an updated chapter on wooden toys in this edition. Karen O'Brien is the editor. There are 792 pages of old toy information. 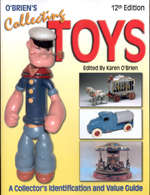 It is written in German and English and shows a lot of never published catalogue pages of these toys. 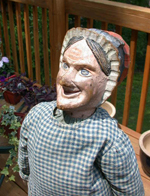 We have a page with our recommended antique toy readings with ordering links to Amazon.com. We hope you will order any toy books you may want through this site as we are an Amazon.com associate and referral fees are used by us to support our wood toy research. A beautifully photographed price guide for the Schoenhut circus is now available for $15 postage paid. 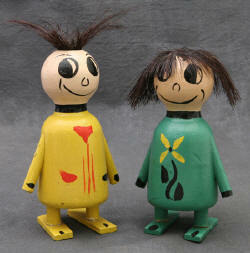 We have histories for over 50 early wooden toy makers. 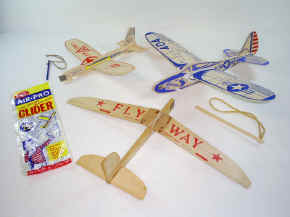 Dave Pecota has written a fascinating article on Ready-to-Fly wooden gliders from 1915 to the 1950s. Dave has recently added some new information to his article. This is our most popular article. Read it here. Dave has also given us new articles about wood trains Read them here. 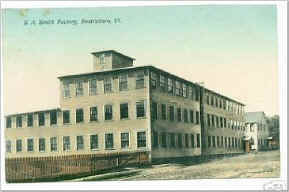 Family descendent Sanford A. Smith has written for us a new history of the famous American toy maker S. A. Smith. He has many photos of the old factories, catalog pages of their toys, and photos of toys and other items from his collection. Read his history here. Click here see other old toy company articles. We are looking for other collectors who would like to participate in this Web site. We need photos, price lists, and articles on pre-1950 toy companies. The photographs in this Web site are protected under domestic and international Copyright laws. 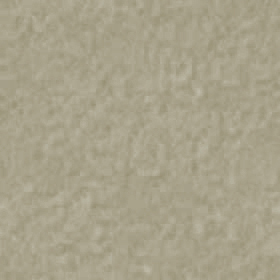 We often and generously grant permission for noncommercial use of our own photos. However, many of the photographs herein are not the property of the Web site but are being used with the permission of the owner. Please contact Jim at jlsneed2@bellsouth.net concerning any photographs for both commercial and noncommercial uses. * Please contact us anytime as we are always interested your comments and questions. We will need an email photo of your toy if you want some information about it. 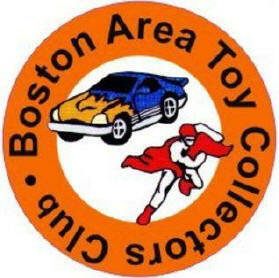 * We sometimes buy pre-WWII toys or find buyers for your early toy or toy collection. * We will do restringing of Schoenhut circus and certain other toys (usually $12.00 - $20.00 each) and some repairs. Don't contact me if you think you can improve my website. This site is already ranked NUMBER 1 in both Google and Bing searches for "old wood toys" and many other "old toy" related search terms. Be sure to indicate a "Subject:" that is old toy related so we can tell it is not junk email. Emails with no Subject will not be opened. I'll need to see pictures of your toy to identify it. I don't know very much about non-wooden toys nor toys made after WWII. Except for Schoenhut dolls, I know next to nothing about dolls.